Published on Tuesday, January 6, 2009. This article appears in the February/March 2009 issue of American Craft Magazine. Large square pendant with a three-point diamond set in 14 k gold from the Forever Young line. Photo/Cole Rodger. JacQueline Sanchez spells her name that way "to have some fun." Good times have long been a creative wellspring for her jewelry. As a teenage Grateful Dead fan, she made silver dancing bears (the band's logo) for fellow Dead Heads. 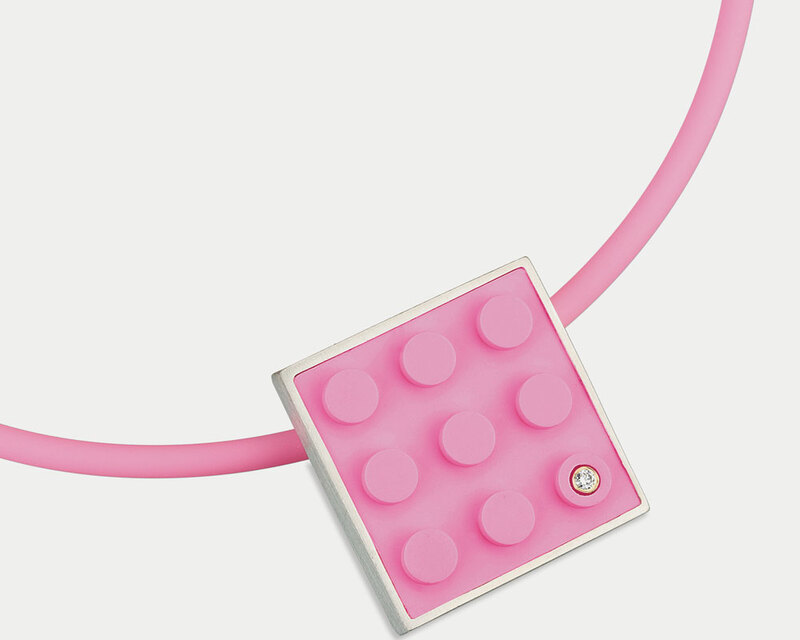 Today, at 37, she turns Lego bricks into colorful, minimalist jewelry that's sophisticated yet playful. 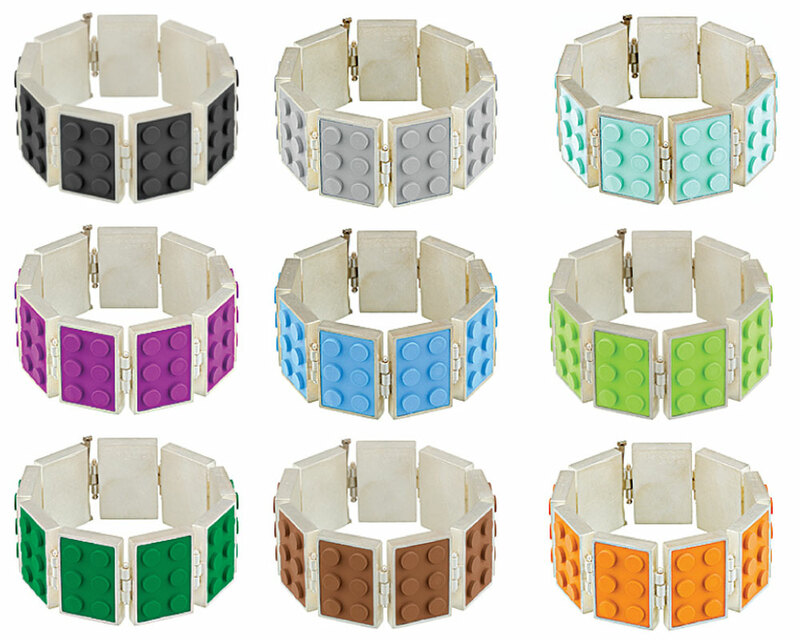 "It hits so many demographics," Sanchez says of the appeal of her Forever Young line-accessories made of Legos that include large square pendants with a three-point diamond set in 14 k gold and hinge bracelets set in sterling silver . Architects love the building reference. Moms savor memories of those little pieces they used to step on. Men covet her cuff-links as a stylish accoutrement to their French shirts. Even the Lego Company has embraced her work, featuring it on the Lego Creation Nation website. A native of Long Island, New York, Sanchez found her calling in a high school jewelry class. "I realized that's where my passion was." After training at the Texas Institute of Jewelry Technolo- gy, she returned East and for a decade honed her skills as a bench jeweler and manager at jewelry stores. Yet while her pieces were well crafted and wearable, Sanchez felt she lacked a clear direction and distinctive look-an instinct echoed by the jewelry marketing consultant Cindy Edelstein, whom she went to see in New York. Riding home on the train from that meeting, Sanchez thought, "Maybe, I need a fresh material to work with. But what?" Her "eureka" moment came soon after. "One morning, I literally woke up and thought, "Toys R Us. Legos." So she bought a tub of Legos and started to play. The rings were a hit at the 2003 American Craft Council Show in Baltimore, winning her an achievement award. Happily focused ever since, Sanchez launched her studio in 2006 in Atlanta, where she lives with her husband and their three-year-old son. For her raw material, Sanchez shops the internet, where "Lego geeks" trade in collectibles. Beyond the familiar reds and blacks, she hunts for rarities like pinks and lime greens. One of her best finds was "this crazy blue, between seafoam and light blue, that I got on eBay." Then there are the treasures found in Lego theme playsets: "I love the Harry Potter one, because that's where I get my purples." Hinge bracelets set in sterling silver from the Forever Young line. Photo/Cole Rodger. "You have to understand basic principles of design and mess with them," says this furniture designer. “I wear jewelry even when I go to the grocery store,” asserts Karen Lorene, owner of Seattle’s Facere Jewelry Art Gallery. Susan Hoge, a master of beadwork, has taken a new direction in which beauty is unsettling, not pretty. Some 50 makers of handmade clothing, accessories and jewelry showcase their wares.